IRWIN, James (1930-1991) was an American astronaut, aeronautical engineer, test pilot, and a United States Air Force pilot. He served as lunar module pilot for Apollo 15, the fourth human lunar landing. He was the eighth person to walk on the Moon and the first, and youngest, of those astronauts to die. 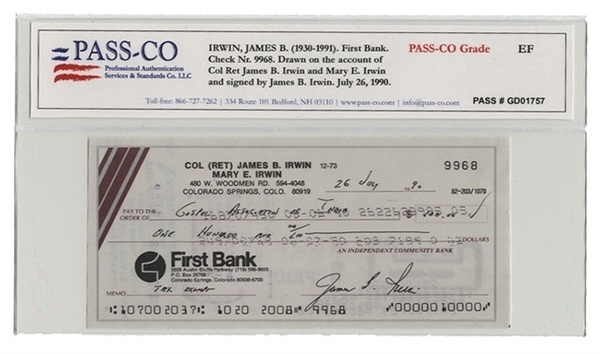 Check Signed, “James B. Irwin” July 26, 1990, authenticated and encapsulated by PASS-CO.